This product is retired but never fear! The Pro RF has been made red. A few notes about the differences. 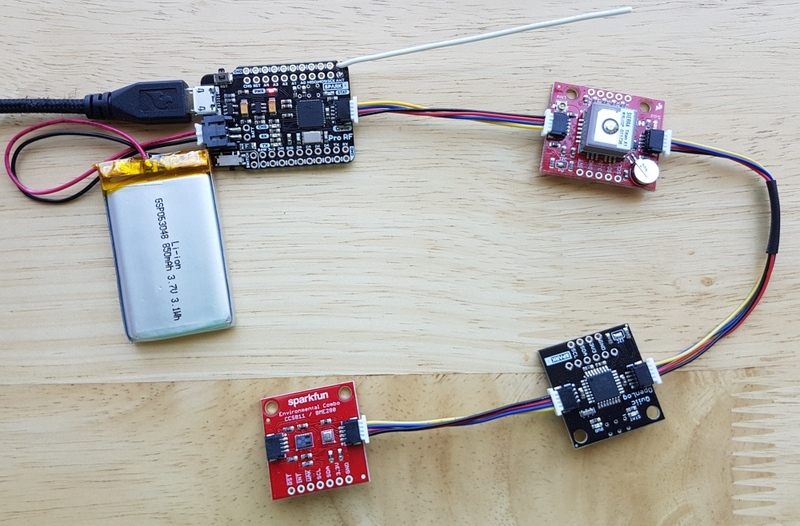 The SparkFun Pro RF uses a LoRa radio (RFM95) instead of the RFM69 and a SAMD21 instead of the ATmega32U4. The range in better on the SparkFun version and you'll have a lot more processing power using the SAMD21. 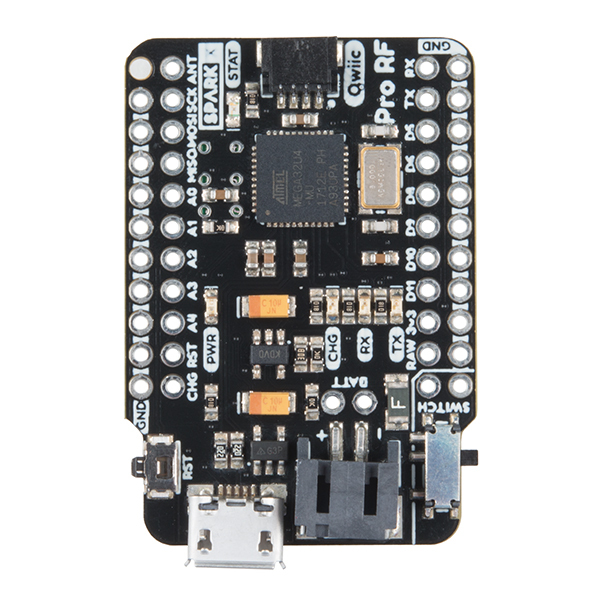 The Pro RF is the mind meld of a Pro Micro and our high-power RFM69 breakout board. What you get is a very compact, easy to use Arduino with excellent point to point data transmission in the 915MHz ISM band. The Pro RF comes with a LiPo connector, a on-board LiPo charger, and a slide switch for On/Off. 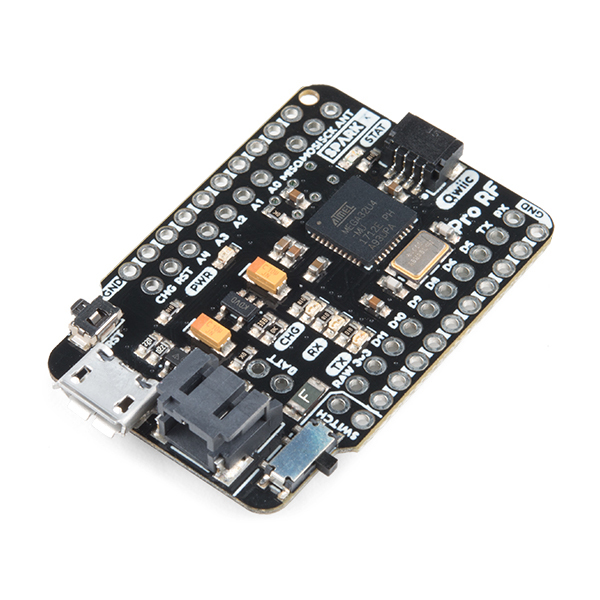 The board programs over a reinforced microB connector with a sleek reset button that fits nicely on the side of the board. We've even added our popular Qwiic connector to the edge of the board making it incredibly fast to add sensors and actuators. Thanks to the RadioHead library, the RFM69 radio is an easy to use packet radio. This means it's easy to send and receive small packets (up to 64 bytes) over the air complete with software defined frequency control and even 128-bit encryption. 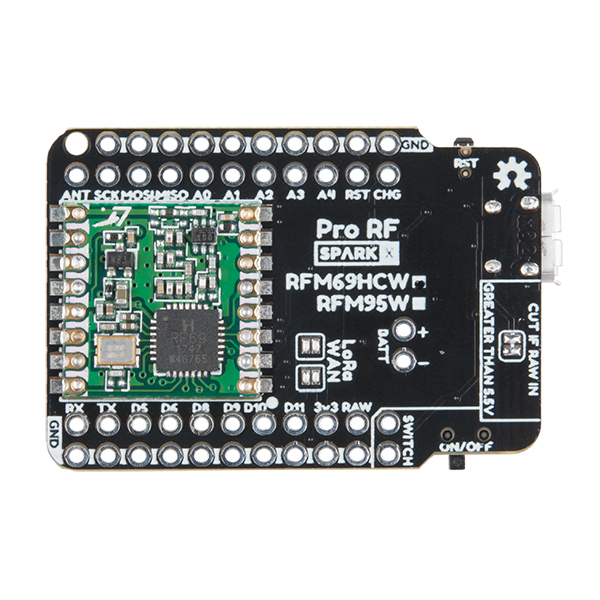 The Pro RF ships with the high-power RFM69HCW capable of +20dBm output. The Pro RF also includes a power switch and 2-pin JST connector for powering from a lithium battery. With the power switch in the off position, the Pro RF will even charge the attached battery! And stop running out of ground pins! 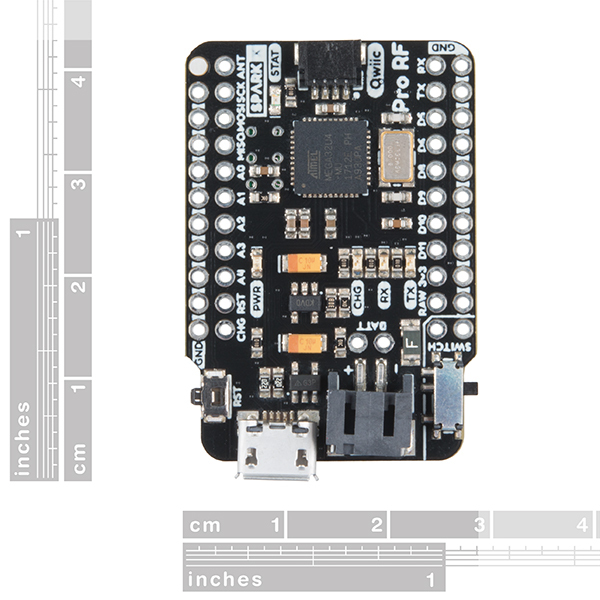 Every pin on the Pro RF is accompanied with a ground connection making buttons and LEDs super easy to connect. And in case your building something to be embedded into clothing or other physically harsh environment the antenna includes a stress relief hole to make sure your wire antenna survives. We were able to transmit reliably across 750 yards (685m) line-of-sight using small 3" piece of wire for the antenna. We've included our sketches used for range testing. Checkout the Pro Micro hookup guide as a general starting point for the Pro RF. Be sure to checkout the RFM69HCW hookup guide for basic knowledge around the radio portion of the Pro RF.